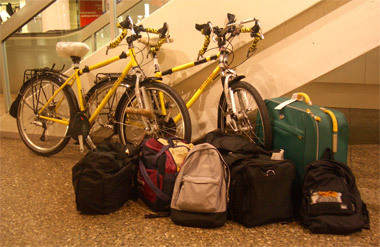 At the airport: before the transfer of our luggage onto the bikes. Our eager plans for departing from Frankfurt's airport on our bikes by noon were obviously conceived in a moment of madness. We didn't even arrive at the huge airport from our suburban Koblenz airport that had been our port for Rome until noon. Then it was time for sandwiches and waiting for our bikes to be fetched from deep storage. Our after-midnight arrival in Koblenz the night before left us short of sleep and less than efficient as the afternoon wore on. But we plugged away at shifting the load from a suitcase, a duffel, 2 soft carry-on bags and our light-duty backpacks into our panniers and on to our back racks. Fortunately, the in-transit damage to our bikes hadn't gone beyond cracking 2 of Bill's 3 water bottle cages and breaking the mounting for my tail light, or we would have been even more way-laid. So instead of heading out at noon as envisioned, we were underway a little before 4pm. We didn't seriously consider getting a hotel at the airport as we were both anxious to ride, but no doubt rain would have changed our minds. The same 80°+ weather that we'd experienced in Rome was in Frankfurt too, thanks to a powerful weather system bringing heat north from the Middle East. Finally, loaded & ready to go. We'd only planned to ride an hour or 2 and then hang it up for the night, but the expected lodging opportunities didn't materialize. When we finally found a town with some hotels and pensions around 7:30pm, we were informed that they were all full for the night. A kind hostess made calls on our behalf and we biked part way back to the airport to stay in an overpriced and seriously over-cluttered pension. We grumbled all evening as we bumped into a defunct refrigerator, chairs filled with pillows, and tabletops consumed with trinkets We were making dinner when we should have been getting ready for bed, which wasn't how we'd wanted to close the first day of our riding season. The bright side of the evening was having CNN, the first news we'd heard in a week and a half, and learning that Italian air service was in chaos because of 2 strikes. We couldn't tell for sure if our minor airport outside of Rome had been affected, but we considered ourselves lucky to have left Italy the night before the dual strikes hit the airline industry. Our second riding day also got off to a slow start as we spent much of the morning reorganizing the gear in our panniers. We didn't sort down to the underwear and sock level the day before in the airport corridors, but instead regrouped bundles. Having our gear well organized is an investment that pays big dividends, so we were both motivated to at least start the process before hitting the road again. My grumbling from the night before continued into the morning when I discovered that the oily crumbles from a bag of spilled walnuts had sifted all the way to the bottom of my pannier. Day 1 of the riding season with new clothes and fresh gear and I was already doing damage control from greasy bits that got into everything. Day 2 found me cleaning another mess in by big kitchen bag ("Chucky") that lives on my back rack. Liquid from the bag of olives used to supplement our rather bland tomato sauce at dinner the night before had managed to escape from the heavy duty store packaging and my second, outer bag. We spent 15 minutes wiping, washing, and rinsing the residue off a dozen other bundles of provisions that it had dripped on to. I only carry 3 major bags and by the end of Day 2 I was cleaning up a mess in the second bag. It was all annoying enough but those kind of mishaps are usually Bill's domain, not mine. 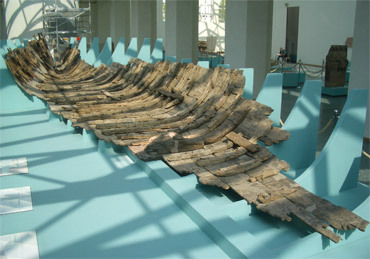 Reconstruction of 400's ce Roman river boat. But like at the end of Day 1, the TV news had us feeling lucky. We only got bits of the story in German, but it looked like serious flooding and wind-toppled tree damage had occurred overnight in Germany. It appeared to have all happened to the northeast of us. All we'd noticed in our area had been threatening skies, a few drops of rain, and some gusty wind now and then--whew! Day 2 had us starting late and then hanging it up early at Mainz so as to take in an ancient boat museum--a museum Bill read about while eating lunch across the river from the city. The museum visit extended the string of Roman-era freebies we'd stumbled onto beginning in Rome during their week of culture. This German museum was inspired by a half dozen buried wooden boats discovered where Hilton was trying to build a hotel in the early 1980's. Five of the boats were Roman military vessels that sank during a barbarian raid around 400 ce. The sixth relic was several hundred years older and more of a barge-like craft of a regional design though it was huge. 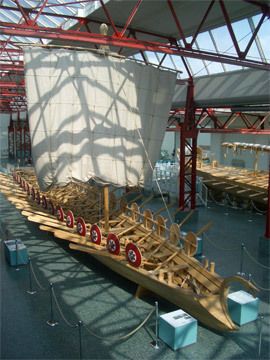 The museum featured full-size reconstructions of 2 of the Roman boats as well as the excavated fragments of all 6 boats. An impressive staffed woodshop was a part of the museum building and it had generated several dozen 1:10 scale models of ancient boats from around Europe. They appeared to be mostly based on finds at archeological sites, including craft from around Rome's airport and England. The scale models ranged from 1 man craft that would fit it your hand to those longer than a large car. Stopping for the museum unexpectedly truncated our riding but made for an idyllic day. We'd biked on signed routes along the Main and then Rhine Rivers; picnicked in a quiet riverside park; ridden into the old town to find a hotel across the street from the museum; and then strolled the lovely old town after seeing the boats. It was a sunny, warm day and the lively, pedestrianized shopping district made for a pleasant closing to our laid-back day--a day without any more spillage crises. The salvaged ruins of the reconstructed Roman vessel. The morning out of Mainz was delayed by more shopping and a chance visit with a patron of 1 of Mainz's 2 outdoor book exchanges. It was the product of an art project done by 2 American students in 1994 with a 2 month life expectancy. The project was wildly popular with the neighbors and has been self-sustaining ever since. Intended as a library, it has become an exchange as the patron said few of the books ever come back. But fortunately, there aren't any crazy hoarders in the neighborhood who drain the shelves, and so a stream of donations maintains the inventory. From the way he talked, we wondered if he didn't sift through the shelves on an almost daily basis. 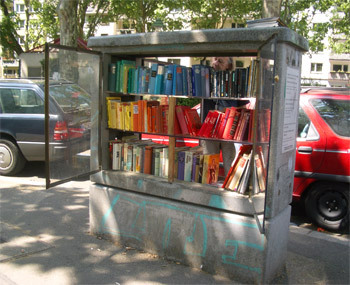 He said that there were a half dozen similar outdoor book cases in other European cities. We finally made it out of Mainz and were soon on the Rhine River headed for Koblenz. That route took us along a stretch of river that has been designated as a UNESCO World Heritage Site since the first time we rode it in 2001. The many restored castles, vineyards, and charming old towns make it a delightful area. The American-conceived, outdoor book exchange at Mainz. We are always mesmerized by the heavy barge traffic that hauls coal, scrap metal, containers, and other goods on the river with a carbon foot print of about 20% of that of long haul trucks. Most of the barges have a car or 2 stashed on top and 1 even had a fenced child's play area on the low cabin roof. Almost as many long-distance, barge-like cruise boats from several countries also plied the waters, as did dozens of day-trip tourist boats. There would be a half dozen boats on a bend in the river at a given time. Turning the corner at Koblenz where the Rhine and Mosel Rivers converge brought a number of changes with it. The water quality or traffic control must be different on the Mosel as a lone water skier, a few sail boats, a scull, a few wooden canoes, and fisherman appeared, none of which we saw on the Rhine. The amount of barge traffic dropped down too, though there was almost always a barge in sight. And the always fascinating locks that allow for elevation changes in the river way became numerous. 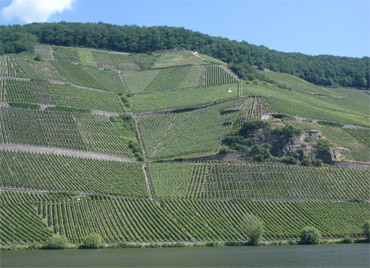 Our view of the Mosel River vineyards during a juice break. Lodging prices for us started at a high in Rome and were precipitously dropping as we flew to Frankfurt and then biked into the smaller German towns. Our first night on the Mosel River delivered a bright and spacious 2 room place with a frig and English news on the TV for a mere $45. These "Privatzimmers" (private rooms) in homes can be a delight. Even though they usually only have 2 or 3 guest rooms, we still get the private bathrooms that we enjoy in hotels but usually with bigger, better appointed and quieter rooms--and the bikes are never a problem. Unfortunately, riding on the Mosel coincided with a turn in the weather too. We'd been riding in 90° weather and 2 days later the daytime high had dropped 40° and it was raining. The persistent light winds and rain deterred us from lengthening our riding days as our minds and bodies were once again adapting to the challenges. Our host for one night on the last week end in May commented that the sudden weather change had brought snow to the 2500' level in the Black Forest where we planned to be in about 2 weeks. 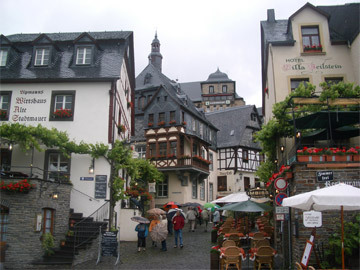 Mosel River towns were charming, even in the rain. 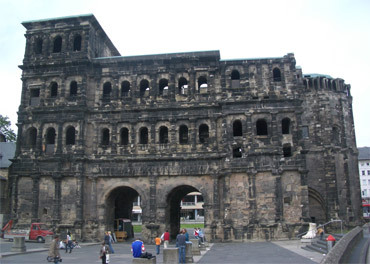 Trier, with a population of about 70,000 when it was the capital of the Roman Empire in the 300's ce was next on our list. We were looking forward to visiting its 3 Roman museums, some for the second time. But we bumped into a classical, unexpected aspect of travel that one has to expect: all 3 museums were closed in preparation for a special exhibit. We were only early by a couple of days, but decided to go on our way. Perhaps if we'd had a lovely hotel room instead of feeling like we had to file a fight plan every time we stood up, we would have waited. But we'd be looping back through Germany after a planned week or so in France, so we'd make a day trip by train to see the museums then. Once again we were grateful for our flexible schedule that allowed us to go to Plan B without it being a major upset. Porta Nigra city gate: still impressive 1700 years later. 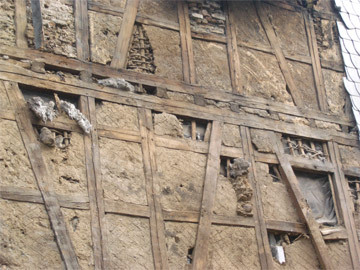 But even without the museums, the Roman presence in Trier still shouted. There was the always imposing Porta Nigra, one of the ancient gates to the royal city, in the heart of old town. Then there was the Throne Room that Constantine had built with its 100' high ceilings and which originally had inlaid marble covering all of the interior wall surfaces. The 9' thick brick walls were deep enough to accommodate spiral staircases in their interior spaces. The giant room was designed with many high windows so that it was filled with light at any time of day and of course, had the highly efficient Roman central heating for the cold climate. And as we left Trier, Bill pointed out a car bridge that is still supported by the 5 massive piers that the Romans built--just amazing. 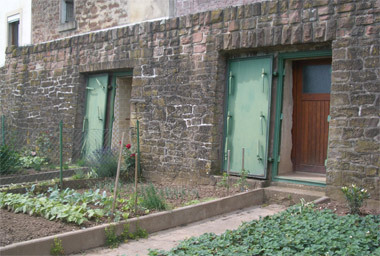 Heavy metal doors & thick walls keep out the water during the floods. Our last night in Germany was less than a mile from borders with both Luxemburg and France, a fact that could be determined without looking at a map but by noticing at the car licenses plates at the supermarkets This small, seemingly insignificant river town had the larger versions of 4 of the main supermarkets trading in this region in Germany. We struggled to turn into their parking lots because of the steady stream of traffic, which is rarely a problem at German markets. You'd have thought it was a rush before a holiday in the States but it was apparently just the usual weekend traffic from the folks across the border. The foreign plates outnumbered the German ones and one note posted on a store window was only in French, not in German. People were hauling a half dozen or more cases of beer and wine out the door in big carts instead of just filling their wicker baskets with the daily shopping. It looked like the press from the French speaking neighbors had pushed the prices up on some items while other items I usually find on German market shelves had disappeared altogether. Within minutes of biking off of the Frankfurt international airport grounds, my thoughts drifted to the changes in gear and routines for which 2007 will become the reference point. Predictably, with each passing year, we are implementing fewer and fewer innovations and yet every year involves some changes or refinements. Almost every change had at least a small test ride in Portland, but the serious field testing had just begun. For our riding hardware, the biggest changes were those Bill made in the process of doing a major overhaul on the bikes. We now have late model tires of the much touted "supple rubber" and they really do feel different on the road--almost like riding on flat tires. Bill located a new model of higher quality brake levelers with more ergonomic handles, which are especially great for me. Cycling equipment is still patterned off of male bodies and so my smaller hands mean I am usually braking with just the tips of 2 fingers. Bill has always looked after me by buying the most suitable levelers, bending them as possible, and adjusting them so I can grab hold of them before they engage but these new levers are easier to grip for both of us. The direction we move our rear gear shifter leveler to shift became reversed with new shifters and derailleurs. But despite 40,000-50,000 miles of riding with the old familiar pattern, the new, more intuitive system that matches the front derailleur is taking hold quickly. The lapses back to the old way don't matter much on the current flat land riding as the incremental change is small on the rear derailleur. Had the change been to the front, we'd halt or lurch each time we fumbled. A new mini-rack with the smallest load of books. 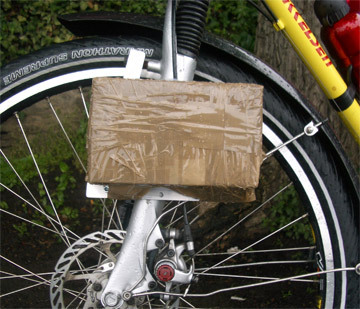 Bill constructed mini-front racks for our bikes so as to tape on a few books and other deep storage items without suffering the extra weight of standard racks and panniers--a clever way to give us a little more carrying capacity. We both switched our loyalty from Teva sandals to Chacos this season though they weigh and cost twice as much. I bought a new, springier model of Teva's early in our Portland stay and noticeably sheared their soles in about 3 weeks of fitness walking so they were out. Bill, who likes a firmer grip on his feet than I can tolerate, wanted a more secure fit. By chance, we both got what we wanted with Chacos, which were highly recommended by several people. Chacos, like Tevas, obliged us with all-black models that draw fewer stares when passerby's seem to think sandal season is over, which it never is for us. And the switch to the Chacos also meant we eliminated the sock-grabbing Velcro that can be a nuisance. My favorite sunscreen cycling/traveling pants were unavailable this year and I begrudgingly gave up the ease of riding pants with 33% spandex in the fabric. I'm crossing my fingers that the more fashionable hiking pants I selected will be comfortable for day after day riding as we both prefer the presentability and sun protection of street clothes over cycling togs. In contrast to the forced new selection of pants, I am happily trying out a new sunscreen shirt with more built in air vents and am substituting paddlers gloves for cycling glovers for more sun protection and less bulk. Last year we bought boots in the Dolomites for doing the Via Ferrata hiking routes and we are hauling them back with us this year. Stuffed in and around them are other purchases to use on those special trails: climbing harnesses so we don't have to try to rent them; gardener's leather gloves with the finger tips snipped off to protect our hands on the steel cables; and light weight carry-all bags and elastic netting to expand the effective volume of our very basic knapsacks. None of the gear is very heavy but we immediately noticed the extra space they demand from our overstuffed panniers. We will mail it all back home at the end of the hiking season to trim our load back down to size. Darn it anyway, the new models of bodies we requested were also backordered, so we tuned the old one's up instead. Bill is optimistic that his new nasal steroid medication will tame the ferocious hay fever he has when we are overseas and he is committed to sustaining his new stretching regime to care for his back. I'm beginning to feel the effects of a medication to allow a recently detected but silent esophageal ulcer heal. Though I don't have the classical heartburn symptoms that would be expected, as the doctor thought, my 3 decades long history of bloating and belching is melting into the background, which is a wonderful change. Along with being remarkably more comfortable, I look and feel thinner without losing a pound. While in flight to Europe, I read about the growing concerns that some dastardly chemicals leach from plastic food containers so we are scrambling to buy metal water bottles for our bikes. Our habit of reusing single use beverage bottles is considered by some to be the worst possible choice. We are also beginning the process of reducing our exposure to leached plastics from other foods we buy. Of course, this is more difficult to do while traveling than at home as glass and ceramic containers aren't an option for us, but we've accepted the challenge to do what we can to reduce our exposure. But compared to all the second hand smoke we inhale in Europe we do have to wonder if it will make a difference. After our first 2 riding days delivered upsets with things spilling in my luggage and learning of near misses with floods in Germany and strikes in Italy, the rest of our first week was a quiet, settling-in experience. Many morning starts were delayed an hour or more with catch-up shopping chores. Finding just the right maps and bike route books took scouting bookstores in several towns and Bill spent several hours securing another pair of "sim cards" for our new cell phones so they could be used in Germany. Bill also felt compelled to by a Sonicare toothbrush designed for European voltage and plugs to care for his ever-precarious teeth. And we picked up some aluminum water bottles at a Wal-Mart type store for half the price of the more prestigious Swiss bottles. We'll keep looking for stainless steel, but if we only use water in the aluminum bottles they should be safer than the single-use plastic bottles we were reusing. These were all more time consuming purchases than that of the usual fare of olive oil, salt and detergent that get restocked at the beginning of each riding season. But the unseasonable 90° heat made shorter riding days inviting, as did being off of our loaded bikes for the last 3 months. Flat river riding and 20-25 mile days fit in well with the extra shopping, stopping to identify a fox glove and then a tulip tree, and the daily necessity of visiting the strawberry stands. It wasn't long and we were already drawing conclusions about our new gear. My new pants proved to be cooler in the heat than the unavailable one's I've pedaled in for years. And my new kayaking gloves were cooler than standard cycling gloves. Bill got immediate, rather than the advertised delayed, hay fever relief from his nasal steroids and the fact that his eyes still itched verified that he was still surrounded by troublesome pollen. He was quick to pronounce that his back was the best it had been in several years, adding to his commitment to his new stretching regime. And those supple rubber tires were like having a second set of shocks on our bikes as they smoothed out the jarring from curbs and potholes. Our second week of riding began with an almost doubling of our daily mileage to the 45 mile range. Somehow the river riding accumulated proportionately more elevation gain too, going from only a few hundred feet a day the first week to over a 1000' a day early in Week 2. It helped that the persistent 5-10 mph headwinds died down with the latest storm system, making it easier going despite the unwelcome rain and chilly weather. 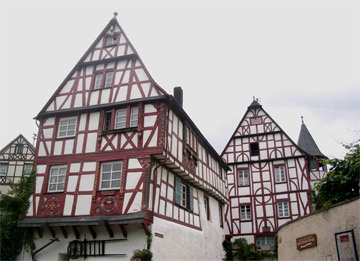 "Fachwerk" is a style often seen in the old German river towns. Settling in during Week 2 also meant scheduling time for our studies. We began watching an "Origins of WWII" DVD lecture series during dinner each night. The 30 lectures delivered in 30 minute segments are a welcome way to get our history lessons while on the road. After that, we have a series on Mesopotamia and the US presidents for a little variety. We also are committed to finishing a fascinating book, Guns, Germs & Steel that we both started in New Zealand. It's a bulky book and we are anxious for the space it will create when we can leave it behind. Our language studies have suffered in this transition, with both German and Italian needing attention though they haven't made it on to the schedule yet. We began our European bike touring in May of 2001 in Germany, which proved to be a very comfortable starting point for Bill. His diluted German heritage and study of the language in high school and college made it familiar even though he was too shy to apply his language skills. Weeks later when we abruptly plunked ourselves down in the middle of Italy by train to escape the torrents of rain making our tent a liability, he panicked. His confidence as a traveler withered in the unexpected culture and language shock and it took him weeks to recover. Ironically, when we returned to Germany this week after 10 days in Rome, Italy was looking like a better fit for him. The orderliness of the Germanic culture that in the past had been comfortably reassuring was now seeming too rigid. On each of our first 2 riding days in Germany, Bill was chided by oncoming riders for lingering too long over the imaginary center line on the bike paths. That more casual use of the road that the Italians are notorious for was taking hold. And he rolled his eyes when on the third day we over heard a merchant kibitzing a strawberry vendor for letting his umbrella overhang the pavement a smidge instead of keeping it over the sidewalk. But the more structured German society also meant that the hyper-vigilance we exercised in Rome could drop away. I consider myself very meticulous in keeping my belongings secure but in Rome I was scolded twice by merchants for not buttoning up my bag quickly enough because of the risk of theft. In contrast, in the German cities we rode through, the women rode their bikes with their hand bags casually plopped in their back basket. 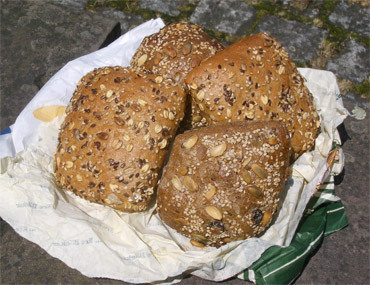 And once again, the readily available, wonderfully hearty breads of Germany was one of the instant joys of traveling there. The breads you encounter for the same effort in Italian and the US pale in comparison. Oh, how different the obsessions and the priorities. I carefully shopped for table salt with iodine in it and found none in the first big grocery store I visited in Germany. Instead, all of the products contained fluoride, an element we scrupulously try to avoid ingesting. And curiously, folic acid was another readily available additive in table salt. The local shunning of iodine was underscored when we noticed a baker promoting his bread as iodine-free, something I've never noticed before. Walls like this are never revealed in downtown Portland. In the US, organic foods are set aside in special departments or in specialty shops. In contrast, in Germany sometimes "bio" products of flax seed, pasta, and chocolate were the only options at the budget supermarket chains--and at rock bottom prices. And those flax seeds that we enjoy adding to our cereal that are indigestible unless ground are always presented whole when available at German breakfast buffets. I'll do my best to reign in my whining about the smoking in Europe this year, but it still astounds me that they aren't getting it, especially in Germany where the population seems to treasure walks in fresh air. Second hand smoke isn't yet acknowledged as a menace. For a moment I thought it was changing as the Frankfurt airport proudly promotes itself as a smoke free environment. After gagging on billows of smoke, I read the fine print that said "Except in designated areas." Unlike what we are used to, the designated areas had no venting and just concentrated the smoke at various locations in the corridors. We spent hours waiting for a flight in a huge, almost empty hall and could tell every time a smoker lit up in the designated area on the opposite side of the room as there was no place for the smoke to escape. And these folks smoke. While standing on the edge of the lone shade tree at a riverside rest stop, we ate our lunch while a pair of smokers poised in the center of the shade went through 5 cigarettes between them. It was 1 of several picnics spoiled for us by suddenly becoming downwind of yet another smoker or 2. People think nothing of lighting up next to some one not smoking in close quarters or enveloping their babies or children in their toxic discharges. We are shifting back and forth between Germany and France every few days to pick up the best sight seeing attractions in this old, heavy-industry region of both countries. A Celtic burial tumuli, Roman exhibits and ruins, a 19th-20th century steel mill, and WWII fortifications have all had their moment of glory. Soon, history will take a back burner to grand panoramas as we will be heading south towards the Dolomites of northern Italy, hoping to arrive in that region of the Alps in early July. We've only been in Europe for a little over a month and it seems like we never left: jet lag is a thing of the past and the river-riding has been pleasant. We've regained enough pedaling-specific strength and settled into our daily chore routines so that our focus is on the sight seeing and not on the mechanics of traveling. The picnic lunches that are usually high points of each day have often delivered relaxing intervals in beautiful settings. We did suffer through a rainy spell and now are dodging rapidly passing thunderstorms each day. Life is good.